As the UK’s largest manufacturer of radiators, Stelrad handles 50,000 deliveries per year from its South Yorkshire distribution centre. To maintain its industry-leading 99% ‘Customer On-Time Delivery’ status, the company requires a reliable solution to maintain productivity levels. When Stelrad recently expanded its National Distribution Centre and required a new materials handling equipment solution, it turned to Yale sub-dealer, Forkway. “Forkway is our sole supplier for materials handling equipment and has played a significant role in the development of our warehousing and distribution operation,” said Paul Schofield, Warehouse and Distribution Manager for Stelrad. The National Distribution Centre was built in 2003 to process and handle stock as it went out for delivery. Thanks to steady growth, there was a need to extend the distribution centre. To ensure the premises were fully maximised, a new materials handling solution was required. “For us to achieve our goals, the equipment needs to be running throughout the 24-hour shift period,” said Paul. After an initial consultation period to understand Stelrad’s requirements, Forkway proposed an extensive and customised solution to minimise delays in handling and despatching stock. 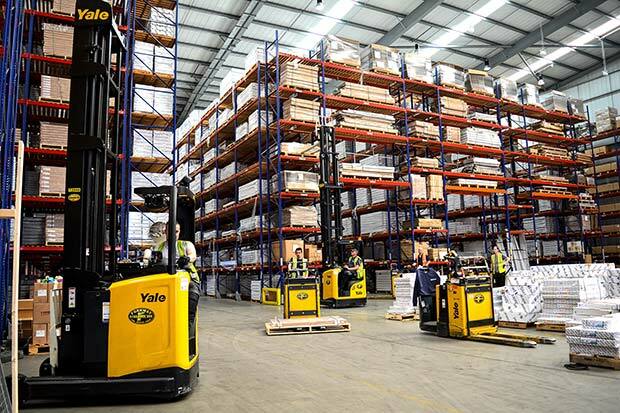 Six heavy-duty Yale® MR20HD Reach Trucks were delivered, offering Stelrad higher travel, and lift and lower speeds. The operator’s wellbeing is at the heart of the ergonomics of the MR Series, with ease of access provided by a low, wide step, integrated grab handles and an adjustable steering wheel position to maintain operator comfort. Push button 360° steering provides greater driving control. Stelrad has already noticed an improvement in driver productivity, with the monitors and HD cameras at the top of the 11m beam allowing precise pallet handling for the operator. To cope with the various pallet sizes, a bespoke fleet of 18 Yale MP20X series platform pallet trucks were fitted with longer forks and repositioned load wheels, minimising damage during pickup and transportation. Having found a suitable solution for Stelrad’s National Distribution Centre, thoughts turned to how to maximise productivity on the production line. Forkway recommended the Yale GLP18VX Veracitor to lift radiator fins onto the production line, alongside three Yale MP20X platform pallet trucks to transport finished goods to the packaging machine, ready for dispatch to the distribution hub. The Yale solution provides Stelrad a seamless operation from beginning to end.